Dawn finishes 2010 much as it began the year, thrusting with its ion propulsion system in steady pursuit of a distant world. During the next year, the probe will arrive there and begin its scrutiny. In the meantime, it continues thrusting patiently, but now with a difference. Dawn is outfitted with three ion thrusters, although it is designed to use only one at a time. (The locations and whimsical names of the thrusters were divulged once the spacecraft was too far from Earth for anyone to see it.) Thruster #3 was the first to see action in the mission, and it propelled the spacecraft until June 16, 2008, after which thruster #1 took over. On Jan. 4, 2010, the ship switched to thruster #2. Prior to this year, #2 had accumulated little more than a day of operation for some tests. But in 2010, it operated flawlessly for 304 days, and Dawn accomplished nearly all of its thrusting this year with only that thruster. While #2 is ready for much more, on Dec. 6 mission controllers assigned thrusting to #3 as part of the strategy of balancing the work for this long journey among the three units. During its extensive service this year, thruster #2 expended less than 79 kilograms (174 pounds) of xenon propellant. With its uniquely efficient but exquisitely gentle touch, the thruster accelerated the ship by more than 2.2 kilometers per second (4,900 mph). Some of our more dawnscriminating readers will recall that the actual velocity is complicated by the effects of the spacecraft's orbital motion around the sun. This has been discussed in several, if not 602.2 sextillion, logs (this one being a good example), Nevertheless, the change in speed is an effective and common measure of the effect of a spacecraft's maneuvering. Thruster #3 had remained idle for 2.5 years, waiting with the same patience it displays when thrusting. Earlier this month, the long hiatus ended; it came to life again and operated as smoothly as ever. It is once more powering the ship ahead, impelling the probe toward its July rendezvous with the mysterious and alien world Vesta. In addition to ensuring Dawn's journey to Vesta continues to go so well, the operations team has been making good progress formulating the detailed instructions the robotic explorer will follow when it is there. Earlier this year, we examined what the ship will do as it approaches the distant port and how it will sail into orbit under ion thrust as well as what it will do in the first two principal science phases, survey orbit and the high altitude mapping orbit (HAMO). Engineers are working now on the timeline of commands, known as sequences, for the third major science phase. To learn more about that, all you have to do is wait a year and read about the activities the spacecraft is conducting. For the more impatient readers, we present an overview here. 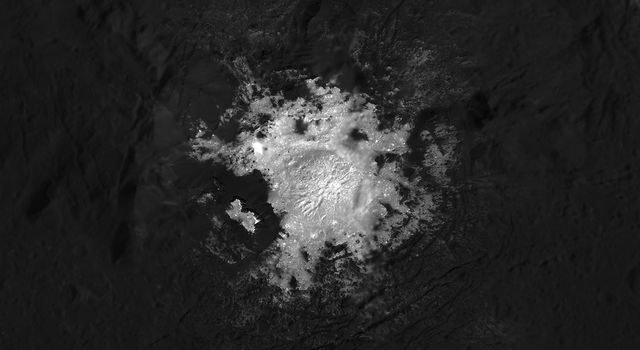 From HAMO, at an altitude of about 660 kilometers (410 miles), Dawn will have an excellent view of Vesta, close enough to see plenty of fascinating details and yet far enough to allow its science camera to cover most of the surface of this uncharted world during the month of mapping. In addition to using the camera to develop the global maps, the visible and infrared mapping spectrometer (VIR) will be trained on many regions, providing even better resolution on the minerals that compose the surface than it could achieve from the higher survey orbit. When its work in HAMO is complete, the craft will fly in for an even closer look. We saw in April that just as the interplanetary traveler has spiraled around the sun from Earth on its way to Vesta (and will do so en route from Vesta to Ceres), it will spiral around Vesta as its ion propulsion system takes it from one orbital altitude to another. Although operation of the ion propulsion system itself is independent of whether it is in orbit around the sun or around Vesta, there is much more to thrusting than that one system. There will be several important differences in how the mission control team plans the flight profile and operates the craft when transiting from one orbit to another at Vesta, and we will consider those in a future log. We also will see that as-yet uncharacterized physical properties of Vesta itself will affect the nature of the trip. The operations team has been working hard to prepare for the many possibilities that might be found at this unexplored world. Dawn's target after HAMO will be an altitude of around 180 kilometers (110 miles), closer to the surface beneath it than most satellites are that orbit Earth. It may take six to eight weeks to follow the winding path from HAMO to this low altitude mapping orbit (LAMO) under the delicate push of the ion thrust. While that may seem like a long time, a mission to Vesta that relied on conventional chemical propulsion would be quite unaffordable within NASA's Discovery Program, and a mission to both Vesta and Ceres would essentially be impossible. In a real sense then, the time to travel from one orbit to another is about as fast as possible given humankind's present selection of tools for probing the cosmos. Dawn will spend about two months in LAMO, revolving around the rocky body once every four hours. The science camera will acquire many exciting pictures from this new vantage point, and while they certainly will afford a better view of some regions than could be obtained in HAMO, that is not the primary objective of LAMO. Images and observations with VIR will be a valuable bonus, but the primary science data will be in two other areas. The gamma ray and neutron detector (GRaND) will have been operating continuously since the approach phase, but it will be in LAMO that it is most effective. (Despite its name, even in LAMO when GRaND is the star of the show, it retains its endearing humility.) The instrument is designed to detect the byproducts of cosmic rays hitting Vesta. Cosmic rays are energetic radiation, composed of a variety of particles, that pervades space. As Vesta's surface is exposed directly to space, cosmic rays strike the nuclei of atoms in the uppermost meter (yard). (The radiation would reach Earth's surface as well if not for our protective atmosphere and magnetic field.) Some of the gamma rays and neutrons produced by these impacts make their way back into space, carrying the signatures of the atoms. When GRaND is in LAMO, it will sense enough of the emitted particles to reveal the identities of many kinds of atoms in the surface. It also will record some radioactive decays of atoms there. GRaND can detect some of the cosmic rays directly, and it has done so whenever it has been tested in flight, far from a planetary body (see, for example, here). It also observed gamma rays and neutrons from Mars during the spacecraft's brief visit there last year. Unlike the relatively bright light reflected from Vesta's surface that the camera and VIR detect, the subatomic particles GRaND measures provide a very faint signal. Just as taking a picture of a dim object requires a longer exposure than for a bright one, to make GRaND's “picture” of Vesta will require a very long exposure. 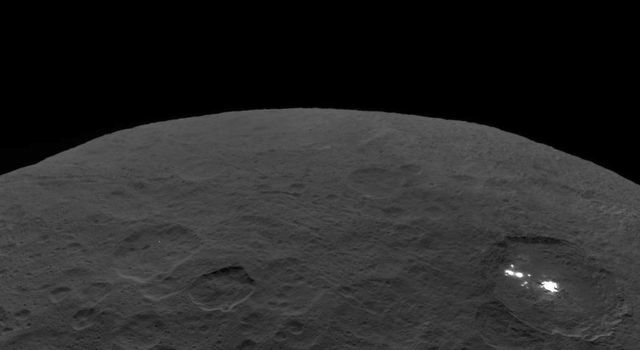 So, much of Dawn's time in LAMO will be devoted to pointing GRaND at Vesta and letting it measure the energy and other properties of the particles that come its way. Dawn was designed with all instruments pointing in the same direction. Even when GRaND is the principal instrument, simultaneous bonus observations with the others (when not precluded by other constraints) will greatly enhance the data returned from LAMO. In addition to providing GRaND's measurements of the elemental composition, LAMO is designed to enable another important method of characterizing Vesta. As Dawn travels in its orbits, its motion is dictated by the combined gravitational attraction (which depends on the mass and distance) of all of the matter within the giant protoplanet. By making ultrasensitive measurements of the probe's orbit (more accurate even than for the normal needs of its deep-space navigation), scientists can calculate the arrangement of Vesta's constituent masses. If, for example, there is a volume far below the surface filled with rock of greater density than the surrounding regions, even though it is hidden from the instruments, its stronger gravitational pull will reveal it. Dawn will accelerate just a little as its orbit brings it closer to this feature and decelerate just a little when it has passed by. These effects are miniscule and the measurements very challenging, but the view of the interior of Vesta, from crust to core, will be rewarding. There is good reason to believe Vesta has a complex internal structure, as do the other large rocky residents of the inner solar system, one of which is immediately beneath your correspondent as he writes this and some of you as you read it. In addition to Earth and Vesta, Mercury, Venus, the moon, and Mars all are thought to have grown very hot as they were forming, and that caused the minerals within them to separate into layers of different composition. In this process, known to planetary geologists as differentiation, the denser materials tend to sink while the lighter materials rise to the top, and when the body cools, the layers are frozen in place. Other processes during the history of the planet may create pockets of higher or lower density rock as well. Vesta may be the smallest relict from the solar system's formation to have experienced planetary differentiation, and the information scientists glean from studying the interior structure (in concert with all of Dawn's other measurements) will contribute to understanding the process by which planets formed. Even though it is Lilliputian compared to the planets, Vesta is Brobdingnagian compared to most asteroids. In the context of planetary formation mechanisms, its closer brethren are the rocky worlds named above. To make a good map of the interior structure, measurements of Dawn's orbital motion need to occur above all parts of Vesta. In essence, scientists use the spacecraft to map variations in Vesta's gravitational field. Several different kinds of data are required to do this, but the principal type is the Doppler shift of a radio signal transmitted from one of the giant antennas of NASA's Deep Space Network to Dawn, which then sends a signal back to the same antenna. 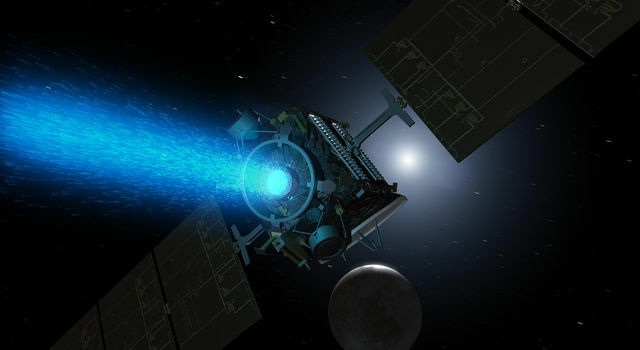 This technique was applied to calibrate the gentle thrust of Dawn's ion thrusters early in the mission, and it will be performed so exquisitely at Vesta that changes in the distant craft's speed of about 0.1 millimeters per second (1 foot per hour, or a five-thousandth of a mile per hour) will be evident. So with the ship sailing over the alien world, mapping the gravity field is accomplished not with an instrument pointed at the surface but rather with the main antenna aimed at distant Earth. It is likely that the irregularities in the gravity field not only will permit insights into the interior of Vesta, but they also will perturb Dawn's path enough that the probe will have to maneuver to maintain the orbit within the parameters needed for operations. Therefore, the ion propulsion system will be used about once a week for a few hours to adjust the orbit. The specifics of these maneuvers will depend on the details of the gravity field, which won't be known until Dawn measures them. Nevertheless, engineers plan windows for the orbital corrections now and will work out those specifics when they measure the craft's orbit. In order to obtain the data needed for the map of the atomic constituents and the map of the interior mass of Vesta, Dawn will spend more time in LAMO than any of the other parts of the orbital mission. In both of the preceding science phases, survey orbit and HAMO, as well as the fourth phase, which will be the subject of a future log, Dawn will devote most of its time over the illuminated side of Vesta to acquiring data with the science camera and VIR and most of its time over the unilluminated side to radioing that precious information to Earth. Neither the GRaND nor gravity measurements depend on the sun shining on Vesta, however, so that regular schedule will not be followed in LAMO. Completing one revolution every four hours, it would be inconvenient and inefficient anyway to switch back and forth so often between directing the antenna to Earth or the instruments to the surface. Rather, the timing is determined by strategies to ensure good global coverage for the two primary scientific investigations, the need to transmit data when memory is full, and other considerations. Even though LAMO is the lowest altitude from which Dawn will observe Vesta, it is not the final phase of the Vesta mission. Nevertheless, by the time the spacecraft is ready to climb back above LAMO, it will have returned a wealth of breathtaking information that will allow scientists to begin transforming this unfamiliar world into one we know. Dawn's removal of the veil that shrouds Vesta in secrets will nourish everyone who hungers for the exhilaration of new knowledge and new understanding, the excitement of adventure and exploration, and the thrill of discovery. Dawn is 0.060 AU (8.9 million kilometers or 5.5 million miles) from Vesta, its next destination. It is also 2.96 AU (442 million kilometers or 275 million miles) from Earth, or 1,175 times as far as the moon and 3.01 times as far as the sun. Radio signals, traveling at the universal limit of the speed of light, take 49 minutes to make the round trip.